I've done a lot of seemingly crazy things in my life, usually for fun. Two years ago I donated a kidney to my husband out of love. And on Saturday night, I hiked 3,267 vertical feet up Aspen Mountain to support organ donation (well, and because there was lasagna and beer at the top). The race wasn't my idea -- it's an annual fundraiser for the Chris Klug Foundation. Chris Klug had a liver transplant in 2000, and went on to win a bronze medal for snowboarding in the 2002 Winter Olympics. He's the only transplant recipient from any country to win an Olympic medal. His foundation and its outreach arm Donor Dudes spreads awareness about registering on your driver's license to be an organ donor. Running up a snowy mountain with 500 other maniacs isn't a typical Saturday night for me. In fact, aside from hiking with my dog every day, I'm not exactly fit. The Aspen Summit for Life was the first competitive race I've done as an adult. I was on the track team in high school, but I don't have the same body I had at 17 because I've developed a love of cheese and hoppy beer since then. 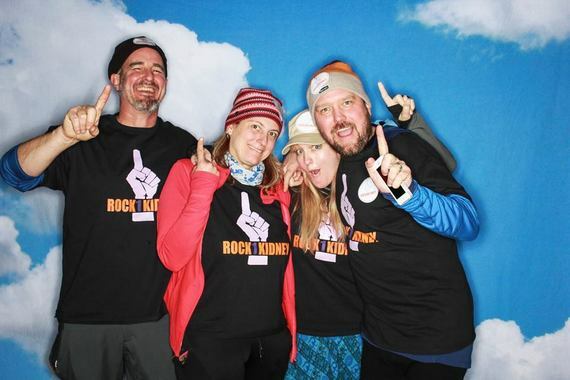 But I have a little nonprofit called Rock 1 Kidney that shares stories of ways kidney donors are rocking one kidney since donating, and I figured if I survived the Summit for Life, it would be further proof that people can have healthy, fulfilling lives as kidney donors. So I recruited my husband Bryan and a couple of fun-loving friends to form Team Rock 1 Kidney. Bryan and I spent three weeks training with our dog, Rio. He's a Lab mix, so he was thrilled to romp around above 11,000 feet. While I struggled with hiking more challenging trails than usual, I really loved being able to eat chocolate without guilt as I sweated up the mountains. And the views could be incredible. But a measure of fear entered the equation when we drove into Aspen and gazed up at the mountain we'd climb that night. The nerves inside my teeth were itching as we registered and picked up our racing bibs. Then a tall guy with a brilliant smile thanked us for coming out. It was Chris Klug himself! He was very gracious -- no attitude whatsoever about being an Olympic hero. Before the race, we took a photograph with Chris Klug and all of the other organ donors, recipients and donor families, which was a moving experience. It's a big deal when a grieving family makes the decision to donate their loved one's organs and tissues to save another life -- on average, 21 Americans die every day while waiting for life-saving transplants. One organ donor can save eight lives. But many people aren't registered as organ donors on their driver's licenses, or haven't shared their wish to be an organ donor with their families. It was never an issue in my family. When I was 16 and got my driver's license, I was squeamish about registering as an organ donor. But my mom said, "If you're dead, you're not going to need your organs. Why not let someone else use them?" Now I can't believe it was ever a question -- I know that if I died, it would give my family a tremendous amount of comfort if my death could give someone else the gift of life, or help a blind person see again. So it was amazing at the Aspen Summit for Life to join hundreds of people dedicated to promoting awareness of organ donation in such a wacky way. The theme song from "Rocky" blared from a loudspeaker as we started charging up the mountain. As darkness fell, the beam of light from each headlamp heading up the mountain represented a person who would someday give the gift of life. It was a stream of hope. When the full moon rose and illuminated our path, I could only throw back my head and howl with my fellow racers. I felt so much love for the organ donor community. And I had a surge of pride in my husband as we grinned at each other and strode across the finish line together. We were greeted by Derek, a racer who'd had a liver transplant just six months ago. Seeing guys like Bryan and Derek power up the mountain with their "new engines" was truly awesome. 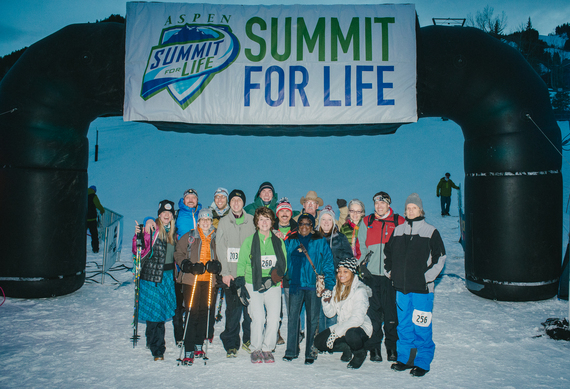 I realized the Aspen Summit for Life is about more than fundraising or spreading awareness about organ donation, it's about inspiring others -- and proving something to yourself. Of course, it's also about celebrating life, and the party at the summit was one for the books. Lasagna has never tasted so good! To register as an organ donor in the U.S., visit www.organdonor.gov/becomingdonor/. For more information about the Chris Klug Foundation, visit www.chrisklugfoundation.org. If you are a kidney donor interested in sharing ways you are rocking one kidney, please visit www.rock1kidney.org.